I’ve been looking forward to The Monuments Men for quite sometime now, as the film is the follow-up from producers George Clooney and Grant Heslov, who produced last years Best Picture winner Argo. I was a massive fan of Argo when it was released, and I admire Clooney for doing lots of work both in-front and behind the camera. Monuments Men was supposed to be released during Christmas a few months ago, but a month before it’s release Sony Pictures pulled the plug on the release date and delayed it to February 7th, 2014. It was a bit of an odd move, as Sony was possibly prepping the film to be a prestigious Oscar contender like Argo, but the made the film look more like more like a commercial picture, which is not a bad thing. So instead of The Monuments Men as Sony’s go-to film for awards season, they chose American Hustle, which is now nominated for 10 Oscars. Did Sony make the right decision with delaying this film’s release? Let’s go and find out. George Clooney writes, produces, directs, and stars in the film as Frank Stokes, an architect in 1940’s America. World War II is at the worst it’s been, and Hitler is threatening to destroy some of the most valuable works of art in all of the world. FDR assigns Stokes and a handful of architects to go into Europe and find these paintings, before they are destroyed by Hitler. The men Clooney assembles for this film is Matt Damon, John Goodman, Bill Murray, Jean Dujardin, Huge Bonneville, and Bob Balaban. Also joining this cast is Cate Blanchett as a woman who assists Matt Damon’s character in finding these works of art. The most fascinating part of this film is that all of this actually happened. It’s all based on a true story, and was documented in a book of the same name by Robert M. Edsel. So with a cast like this, and an Oceans 11/Inglourious Basterds premise that the film is going for, this film should be great, right? Unfortunately, that’s not the case with this film. As I mentioned before, I like George Clooney a lot. The man is one of my favorite actors, he has an incredibly charming presence both on-screen and in interviews that he’s done, and he’s done some fine work behind the camera in the past. Not only did he produce Argo, but his last directorial effort, was a film called The Ides of March, which starred Clooney, Ryan Gosling, and the late great Philip Seymour Hoffman. Clooney, and Grant Heslov, his producing partner, were both nominated for Best Adapted Screenplay for their work on the film, and it’s a really underrated gem that was criminally overlooked that awards season. It’s an old school political thriller that at times can get a little soapy, is still well worth your time. So what happened to this film? Well, it goes for the Oceans/Inglourious Basterds premise, but instead of feeling slick and cool, the film feels bloated and boring, which pisses me off that I say this about this film because I really wanted to like this film, I did. I think what would have helped this film a-lot is if Steven Soderbergh, the director of Oceans 11, had made this film, and tried to repeat the formula from that film into this. But that can’t work, as Mr. Soderbergh is now “retired” from filmmaking. I think that his style and the way that he makes his pictures could have really helped this film with its narrative structure. So let’s get into why this film is as disappointing as it is. 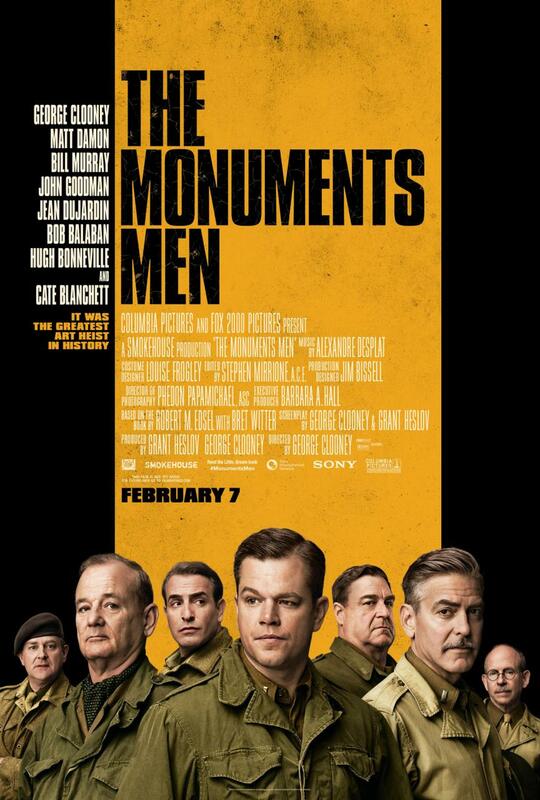 First things first, The Monuments Men is not a bad film, it’s just a disappointing film that had lots of potential. A cast like this would make you think that the film itself is pretty good as well as the script. Because the film markets itself that its gonna be nothing but these great actors on-screen together the entire time, but that doesn’t appear to be the case. Matt Damon’s character disappears for most of the middle act as he does his scenes with Cate Blanchett, which by the way their scenes together were some of the films bright spots. Bill Murray isn’t given a whole lot to do, which is really a shame because Murray is not only arguably the greatest living comedic actor, but he’s also come into his own as of recently as a great dramatic actor, and he basically sleeps through this film. His back and forth with Bob Balaban is entertaining enough, which isn’t much of a surprise as Mr. Balaban is one of the finest character actors out there, but it’s not really enough to help this film. The actors in the film try their best with what they have, but there isn’t a whole lot for them to do in the film. Clooney made the film with a very nostalgic, old Hollywood look at the film. It shows with the score by Alexandre Desplat in the film that has sort of the same vein that John Williams did for the Indiana Jones series back in the day. That nostalgia doesn’t quite help the film be any better than it already is, but Clooney did make a well made film, I will say that. The script isn’t that great, but it’s well produced and well-directed, and maybe I’m just saying that because I like George Clooney a-lot. If I may get to some positives on the film, I’d say that I enjoyed the scenes with Cate Blanchett and Matt Damon, with Blanchett giving the only performance worth mentioning in this film as memorable. I did enjoy the scenes with Bob Balaban in them, and the third act was OK, but the film really started to drag substantially in the second act. So to sum all of this up, The Monuments Men is pretty disappointing. The film could have been a lot like Argo, a great and exciting race against time type film, but if you don’t mind my southern upbringing right now, this ain’t Argo. The cast does its best but it’s not quite enough, and the film becomes pretty forgettable. If you really want to see the film, I’d wait for when the film comes out on DVD or when it hits HBO or something like that. So here’s to The Lego Movie, which I will (hopefully) be seeing sometime this weekend, being a much more entertaining and memorable film this weekend, and according to reviews so far, the film is just that. February 8, 2014 in 2014 Film Reviews, Movie Reviews. OMG Jake, just got back from this movie and I give it a C too.